My dad has a fatal lung disease called IPF (idiopathic pulmonary fibrosis). The end stage symptoms are chest pain, depression, reduced lung function, disturbed sleep patterns, and becoming housebound. “Pulmonary Fibrosis is a disease marked by scarring in the lungs. Tissue deep in the lungs become thick, stiff and scarred. The scarring is called fibrosis. As the lung tissue becomes scarred it interferes with a persons ability to breathe.” Survival for most patients is less than 5 years. The lung doctor told us in December my dad has 12-18 months left which is also the time he denied my dad a lung transplant. My dad has wrote to me this on March 25th 2018 “I lost all hope when denied lung transplant now with the possibility of lung stem cell treatment I have been able to find some more hope again. My life right now is nothing more than being connected and dependent on a 50 ft hose for oxygen. Luckily I have you to make sure I get out every day and help me get in and out of home and vehicle to keep me with something to push forward for. I’ve never had to ask for help and I’m embarrassed to do so now. 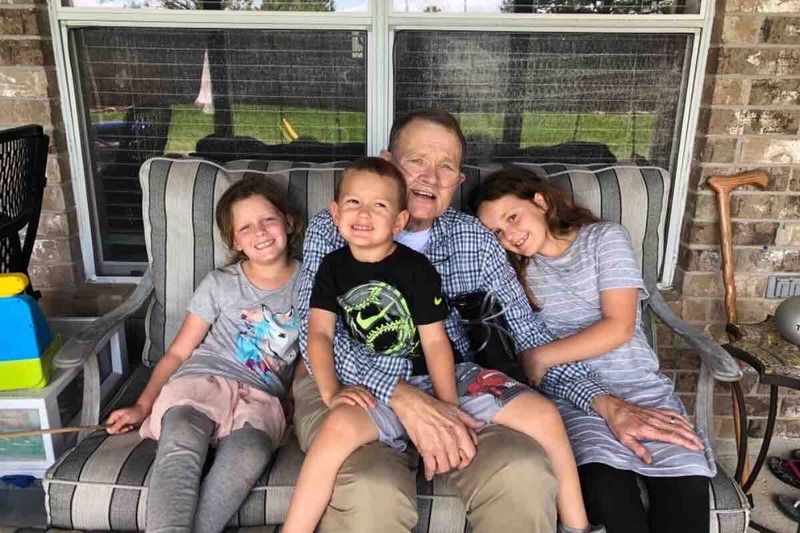 With the procedure I have a chance for more time with your momma (my wife of 47 years), my children, and my wonderful grandchildren who I so much want to see grow up as much as possible. I fear without this I won’t make it to see 2019. There are times breathing is almost impossible and to feel like I’m choking is very scary and a feeling I do longly pray to not keep feeling. I pray this will work even just a slight bit would be so much worth it for me. I love you. Dad.” Please help my dad with this last ounce of hope not only him but our family has for him right now. We know our time is precious and limited and to see him suffer is the worst and hardest thing to endure but even more so on him. Thank you all in advance for any prayers and help you are able to give. Please share with everyone you know the sooner he can get this stem cell treatment the better as each day is not promised. Just wanted to send out an update to everyone to let everyone know how thankful we are to everyone who shared and donated. My dad got his first round of treatment today and gets the second round tomorrow then we will return in three months for the final two. Thank you again to everyone who helped to make this possible. Today has been a very overwhelming and busy day for our family as we are making preparations for our mothers funeral that will be held later this week, but as we stopped and saw the amazing countless contributions that were given today we wanted to say how appreciative and thankful we are to every single one of you. Our mothers main priority was to make sure our father was taken care of and now he gets to have his stem cell treatment and the true blessing is now he has a chance at long term health care. Please continue sharing and praying for our father and our family in this horrific time of our lives. We feel all the support and thank you all so much. We will continue to send updates and we will make sure to send a picture of him after his stem cell treatment procedure! Thank you all again so very much! We are still in such disbelief that anything good can come out of such a horrific event...my mom always made good come out of bad situations though and this is no different for her. The amount of love and generosity our family and father is receiving is unimaginable. We don’t know how to put it all into words but thank you doesn’t give it enough justification. With that said we raised the goal for funeral costs, bills, and possible lung transplant with second dr that we never thought was an option financially or because of receiving a no the first time...he is very blessed and after we start to find our new normalcy somewhat we will sit down and get the stem cell treatment hes been waiting and hoping and praying for thank you all again so very much!